In our continuing feature on Junior Athletes, we take a look now at Australian rider Jonathon Och. 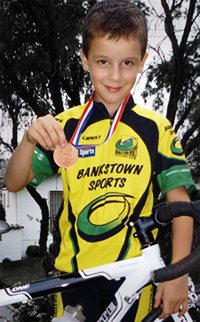 A youngster from a family of riders, Jonathon is already accomplished, having won a junior U9 race and picking up a Bronze Medal in the NSW State Championships. Happy so far with his Pro-Lite "The ONE" bike, no doubt he will be excited by the recent news of our 24" and 650c Track versions of that bike that will soon be released. PL: Could you introduce yourself briefly please? Jonathon: My name is Jonathon Och, I am in 2nd Grade. I began riding on Dunc Gray velodrome used in the 2000 Olympic Games, and have just begun racing at my club’s road circuit at Lansdowne, Sydney. I have been racing for just under a year. PL: Do you belong to any teams? 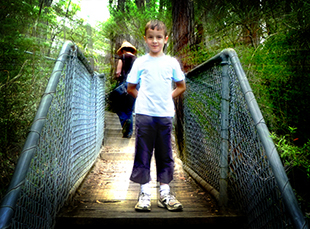 Jonathon: Yes, I belong to Bankstown Sports Cycling Club along with my Mum, Dad and brother. Jonathon: My father took me racing, and I really enjoyed it. I am riding up to the red line on the steep embankments. PL: What kind of riding do you do for fun? Jonathon: I only ride on Wednesday night at the Velodrome, on the weekend and maybe on other days during the week if time permits, where I train with my Mum and Dad and brothers. PL: Could you tell us about your bikes? Jonathon: I have a Pro-Lite “The One” 24 inch road bike equipped with STI gear changers that are easy to use. I have been waiting on a new track version of this road bike, but it was not ready at the time of my NSW State Championships, but instead I road my club bike with the Deep V front wheel from my Pro-Lite road bike, a Pro-Lite Handlebar and achieved a Bronze Medal in the time trial event and fourth placing in the Scratch race. PL: Aside from using the specifically designed Pro-Lite bike, how do you get set up for the special challenges of a Junior sized rider? Jonathon: My Dad modified the gears on the road bike (front change ring 37 tooth instead of 42) which allows me to have a bike with all 16 gears available to race in NSW Cycling Junior bike races. My Dad also set me up with proper cycling shoes to allow me to ride better. On my last road race got up 38 km/h in my sprint, and 46km/h down the hill we have at our road circuit. PL: What do you think about Pro-Lite stuff? Jonathon: I like the white colour and the black labeling, I think it’s cool, and other people really like the bike. I am waiting on the new Pro-Lite track 24 inch bike so I can start training for the next track season. 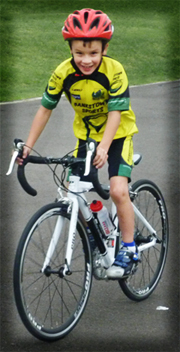 Jonathon: My team Bankstown Sport Cycling Club has its own web page. I also have a picture of myself on the Australian Distributor of Pro-Lite .